Run2Cure Neuroblastoma is great challenge for a great cause. The event is held on Sunday June 2nd, 7.30 am – 1 pm at The Domain and Mrs Macquarie's Chair, Sydney. Run2Cure Neuroblastoma is a set of fun runs organised by the registered charity, Neuroblastoma Australia. It is set in the Domain, one of the most iconic locations in Sydney. Now in its sixth year, the event is the charity’s largest fundraising event for research into the aggressive childhood cancer, neuroblastoma. Families affected by neuroblastoma, friends, running groups, school and corporate teams, come together to show their support by participating in either the 1K Little Heroes Walk, 1K Junior Dash, the 3km, 5km or 10km runs. The run is an opportunity for friends and families to make a significant difference for children affected by neuroblastoma by raising vital funds for research into this aggressive childhood cancer. Please use public transport when possible. St James and Martin Place stations are both about 10 minutes walk. Parking stations: The Domain Car Park flat rate is $10 on 2nd June. It opens at 5am. This has to be one of the most scenic runs in Sydney. 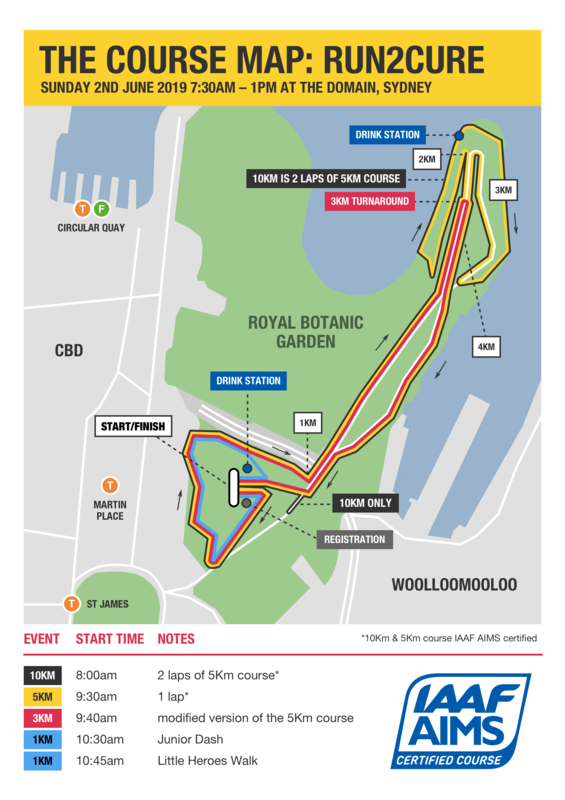 The 10 km is two laps of the 5 km which runs from the Phillip Precinct within The Domain, down by Mrs Macquarie’s Chair taking in the amazing views of Sydney Harbour. It is possible to do this 3 km, 5 km and 10 km course pushing prams or wheelchairs but please ensure you review the route first as there are a couple of steep inclines. The Junior Dash 1k and The Little Heroes 1k are around the Domain (very easy and flat). Prams are very welcome in The Little Heroes 1k. Map of 1 km, 3 km, 5 km and 10 km course below*. It’s easy to Register via RaceRoster. Whether you’re in a school, workplace, making a difference as a lone warrior or want to team up with friends, there’s a way you can get involved. Check that you agree with the following terms before registering. Pulse Performance have kindly put together some 8-week training guides to ensure that you're in shape for race day.